This article is about the historical region of Greece. For the modern administrative region, see Attica (region). For the former prefecture, see Attica Prefecture. For the Athenian neighbourhood, see Attiki, Athens. For other uses, see Attica (disambiguation). Attica (Greek: Αττική, Ancient Greek Attikḗ or Attikī́; Ancient Greek: [atːikɛ̌ː] or Modern: [atiˈci]), or the Attic peninsula, is a historical region that encompasses the city of Athens, the capital of Greece. It is a peninsula projecting into the Aegean Sea, bordering on Boeotia to the north and Megaris to the west. The history of Attica is tightly linked with that of Athens, and specifically the Golden Age of Athens during the classical period. Ancient Attica (Athens city-state) was divided into demoi or municipalities from the reform of Cleisthenes in 508/7 BC, grouped into three zones: urban (astu) in the region of Athens main city and Piraeus (port of Athens), coastal (paralia) along the coastline and inland (mesogeia) in the interior. The southern tip of the peninsula, known as Laurion, was an important mining region. The modern administrative region of Attica is more extensive than the historical region and includes Megaris as part of the regional unit West Attica, and the Saronic Islands and Cythera, as well as the municipality of Troizinia on the Peloponnesian mainland, as the regional unit Islands. 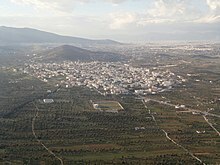 Attica is a triangular peninsula jutting into the Aegean Sea. It is naturally divided to the north from Boeotia by the 10 mi (16 km) long Cithaeron mountain range. To the west of Eleusis, the Greek mainland narrows into Megaris, connecting to the Peloponnese at the Isthmus of Corinth. The western coast of Attica, also known as the Athens Riviera, forms the eastern coastline of the Saronic Gulf. Mountains separate the peninsula into the plains of Pedias, Mesogeia, and the Thriasian Plain. The mountains of Attica are the Hymettus, the eastern portion of the Geraneia, Parnitha (the highest mountain of Attica), Aigaleo and Penteli. Four mountains—Aigaleo, Parnitha, Penteli and Hymettus (clockwise from the southwest)—delineate the hilly plain on which the Athens urban area now spreads. Mesogeia lies to the east of Mount Hymettus and is bound to the north by the foothills of Mount Penteli, to the east by the Euboean Gulf and Mount Myrrhinous, and to the south by the mountains of Lavrio (modern Lavreotiki), Panio (Πάνειο Όρος), and Laureotic Olympus (Λαυρεωτικός Όλυμπος). The Lavrio region terminates in Cape Sounion, forming the southeastern tip of the Attic peninsula. Athens' water reservoir, Lake Marathon, is an artificial reservoir created by damming in 1920. Pine and fir forests cover the area around Parnitha. Hymettus, Penteli, Myrrhinous and Lavrio are forested with pine trees, whereas the rest are covered by shrubbery. The Kifisos is the longest river of Attica. According to Plato, Attica's ancient boundaries were fixed by the Isthmus, and, toward the continent, they extended as far as the heights of Cithaeron and Parnes. The boundary line came down toward the sea, bounded by the district of Oropus on the right and by the river Asopus on the left. During antiquity, the Athenians boasted about being 'autochthonic', which is to say that they were the original inhabitants of the area and had not moved to Attica from another place. The traditions current in the classical period recounted that, during the Greek Dark Ages, Attica had become the refuge of the Ionians, who belonged to a tribe from the northern Peloponnese. Supposedly, the Ionians had been forced out of their homeland by the Achaeans, who had been forced out of their homeland by the Dorian invasion. Supposedly, the Ionians integrated with the ancient Atticans, who, afterward, considered themselves part of the Ionian tribe and spoke the Ionian dialect. Many Ionians later left Attica to colonize the Aegean coast of Asia Minor and to create the twelve cities of Ionia. During the Mycenaean period, the Atticans lived in autonomous agricultural societies. The main places where prehistoric remains were found are Marathon, Rafina, Nea Makri, Brauron, Thorikos, Agios Kosmas, Eleusis, Menidi, Markopoulo, Spata, Aphidnae and Athens. All of these settlements flourished during the Mycenaean period. Until the 6th century BC, aristocratic families lived independent lives in the suburbs. Only after Peisistratos's tyranny and the reforms implemented by Cleisthenes did the local communities lose their independence and succumb to the central government in Athens. 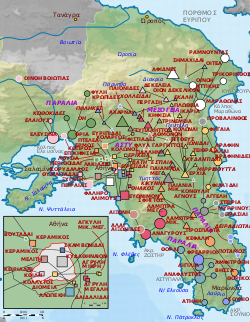 As a result of these reforms, Attica was divided into approximately a hundred municipalities, the demes (dēmoi, δῆμοι), and also into three large sectors: the city (ἄστυ), which comprised the areas of central Athens, Ymittos, Aegaleo and the foot of Mount Parnes, the coast (παράλια), that included the area between Eleusis and Cape Sounion and the area around the city (ἐσωτερικό-μεσογαία), inhabited by people living on the north of Mount Parnitha, Penteliko and the area east of the mountain of Hymettus. Principally, each civic unit would include equal parts of townspeople, seamen, and farmers. A “trittýs” ("third") of each sector constituted a tribe. Consequently, Attica comprised ten tribes. During the classical period, Athens was fortified to the north by the fortress of Eleutherae, which is preserved well. Other fortresses are those of Oenoe, Decelea and Aphidnae. To protect the mines at Laurium, on the coast, Athens was fortified by the walls at Rhamnus, Thoricus, Sounion, Anavyssos, Piraeus, and Eleusis. Although these forts and walls had been constructed, Attica did not establish a fortification system until later, in the 4th century BC. Attica's warfare is displayed by piles of rubble from fortresses from the Chremonidean war. Even though archaeological ruins are found in nearly the whole area of Attica, the most important are those found in Eleusis. The worship of the goddesses Demeter and Cora, beginning in the Mycenaean period, continued until the late years of antiquity. Many other types of worship can be traced to the prehistory. For example, the worship of Pan and the Nymphs was common in many areas of Attica such as Marathon, Parnes and Ymittos. The god of wine, Dionysus, was worshipped mainly in the area of Icaria, now the suburb of Dionysus. Iphigeneia and Artemis were worshipped in Brauron, Artemis in Rafina, Athena on Sounion, Aphrodite on Iera Odos, and Apollo in Daphne. The festival of Chalceia was celebrated every autumn in Attica. The festival honored the gods Hephaestus and Athena Ergane. After the period of antiquity, Attica came under Roman, Byzantine, Venetian, and Ottoman rule. During the Byzantine period, Attica was invaded by the Goths under the command of Alaric in 396 AD. Attica's population diminished in comparison to the neighboring area of Boeotia. The sites of historical interest date to the 11th and 12th centuries, when Attica was under the rule of the Franks. The great monastery of Dafni, that was built under Justinian I's rule, is an isolated case that does not signify a widespread development of Attica during the Byzantine period. On the other hand, the buildings built during the 11th and 12th centuries show a greater development that continued during the rule of the Franks, who did not impose strict rule. During the Ottoman rule, Athens enjoyed some rights. However, that was not the case for the villages of Attica. Great areas were possessed by the Turks, who terrorized the population with the help of sipahis. The monasteries of Attica played a crucial role in preserving the Greek element of the villages. In spite of its conquerors, Attica managed to maintain its traditions. This fact is proved by the preservation of ancient toponyms such as Oropos, Dionysus, Eleusis, and Marathon. During the Greek War of Independence in the 1820s, the peasants of Attica were the first to revolt (April 1821), and they occupied Athens and seized the Acropolis that was handed over to the Greeks in June, 1822. Attica, a place in Greece, has belonged to the independent Greek state. From 1834, Athens was refounded and made the new Greek capital (moved from Nafplio in Argolis), and people from other parts of Greece gradually began to repopulate Attica. The most dramatic surge came with Greek refugees from Anatolia following the population exchanges between Greece and Turkey under the Treaty of Lausanne. Today, much of Attica is occupied by urban Athens. 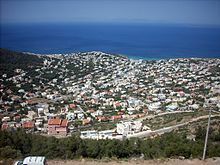 The modern Greek region of Attica includes classical Attica as well as the Saronic Islands, a small part of the Peloponnese around Troezen, and the Ionian Island of Kythira. Attica enjoys a Mediterranean climate. It has a distinct, long, dry period in the summer and a short, wet period in the winter. The highest precipitation is experienced during the winter months. The southern part of the peninsula has a hot, semi-arid climate. According to the World Meteorological Organisation, the official European record for highest temperature was 48.0 °C (118.4 °F) and it was recorded in Eleusina and Tatoi in 1977, by the use of minimum-maximum thermometers. ^ a b c d "History" (PDF). Prefecture of Attica. Democritus University of Thrace. Retrieved 13 January 2013. ^ Osborne, Robin (December 2015). "Oxford Classical Dictionary". Attica. Retrieved 2017-09-29. ^ Osborne, Robin (2015-12-22). "Attica". doi:10.1093/acrefore/9780199381135.001.0001/acrefore-9780199381135-e-952. ^ National Statistical Service of Greece (2002). Στατιστική Επετηρίδα της Ελλάδος 2002 (PDF) (in Greek). National Statistical Service of Greece. p. 54. The table includes the urban areas of Greece, officially defined by the National Statistical Service of Greece, powered by the Ministry of Finance of Greece. The municipality of Piraeus and its greater area belong to the Athens urban area or Greater Athens (Πολεοδομικό Συγκρότημα Αθηνών). ^ "Climatological Information for Athens Hellinikon, Greece", HNMS climatological table, web:  Archived 2016-06-11 at the Wayback Machine. ^ "Climatological Information for Elefsina, Greece", HNMS climatological table, web:  Archived 2011-07-16 at the Wayback Machine. ^ "Climatological Information for Nea Filadelfia, Greece", HNMS climatological table, web: . ^ "Climatological Information for Tatoi, Greece", HNMS climatological table, web: . ^ . Arizona State University World Meteorological Organization. Wikimedia Commons has media related to Attica.